Sitting in a quiet field just off a busy ‘A’ road lies a piece of prehistory, unnoticed by those living in the nearby town. 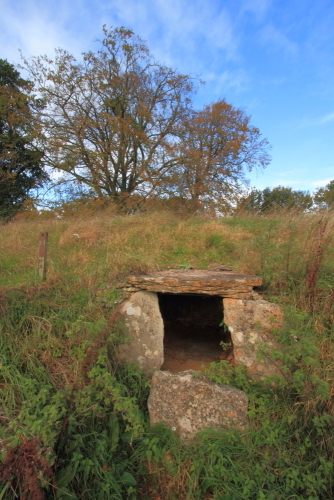 Lanhill Longbarrow may not be as spectacular as the other restored barrows in the area, such as West Kennet, Stoney Littleton or Wayland’s Smithy but is a gem of a burial mound located just a few miles outside Chippenham in Wiltshire. For those with GPS/Sat Nav’s and other devices, you can park off the road at ST 87855 74742 (or 51° 28’ 18.00”N & 02° 10’ 34.37”W) and the barrow can be found at ST 87728 74711 (or 51° 28’ 16.25”N & 02° 10’ 41.00”W). For those without gadgets, the barrow can be found as follows: From the A420 Bristol road out of Chippenham proceed past the junction to Yatton Keynell & Castle Combe for a further 500m and start to slow down just before telegraph poles wires traverse the road. Immediately after this there is a drop in the kerb stones on the left and a short (often hidden) 20m track that leads to a gate in the hedgerow that runs parallel with the road. If you pull off onto this track you are able to park up on the right by the hedgerow and out of the way of the farmer’s gate. Access into the field can be made over the gate which is often locked; however, there is a small stile in a gap the hedgerow 5m to the right of the gate but this can be overgrown especially during the summer. The stile is handy if you have a dog as it has a small access hole which you can open by pulling up on a wooden handle. This route is part of a signposted public footpath that leads to the south side of the field and then up onto Lanhill itself. 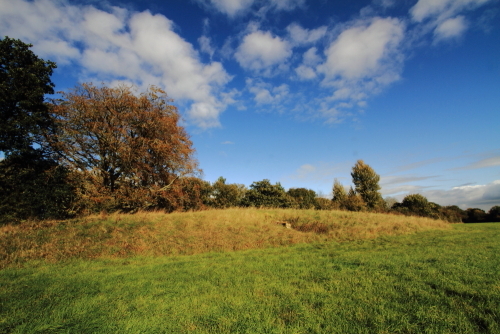 As you enter the field the Longbarrow is a short distance to your right by the side of the hedgerow lying east to west. Once in this field I always feel I have stepped into another little world. The hedgerow seems to screen you from the noisy traffic of the main road especially if there is a bit of a breeze. Often there are buzzards and other birds of prey gliding over head and once or twice I have seen deer on, or near, to the footpath up to the hill, all of which add to the good feeling of the place. Bound on two sides by trees and the large hedgerow the barrow can not be easily spotted from the A350 which runs along side it only 30m away. And although sited in a pasture, its southern aspect is both hidden and dominated by its namesake, Lanhill and the wooded slopes of Lanhill Brake. Hardenhuish Brook, a tributary of the larger and lovely By Brook, runs 75m away to the south and the area in between forms a boggy area in the winter months. I was first introduced to this barrow in 1979 on a field trip for my Archaeology course at Chippenham College and I have been coming back regularly ever since. It was my very first encounter with such a thing and, as I said, although there are bigger and better ones all over the country I feel that, along with nearby Lugbury Longbarrow, I am responsible for this one. Originally the barrow was believed to have been about 190ft long and 90ft wide but Lanhill has had a bit of a traumatic past with various excavations right up into the 1960s and much of the material has been taken for road building and a small a nearby wall. Initially it is believed to have had two chambers on the north side and a false entrance at the east end but because of all the damage these are now all gone. But a lovely little reconstructed chamber does still exist on the south side which you can get into but it is only about 2m long by just over a metre high and wide. When I first used to come here there was a little green plaque but this has now been taken and only the metal post remains. The barrow was also roughly mown and the forecourt was clearly visible but a certain amount of deterioration has taken place. Possibly leaving the grass to grow each year will attract and sustain more wildlife but the deterioration of the forecourt is a concern. One of the angle iron supports for the cap stone (which was once corbelled) is exposed at one end and it looks as if some of the stone infilling has been removed or eroded. There are the remains of a dry stone entrance way and a small entrance stone ‘guarding’ the way in. Constructed about 5,000 years ago it is known as Hubba’s Low according to John Aubrey, however this name has been disputed. Hubba was a leader of the Danes and Low is a burial place but no real record showing a link to Hubba can be found and of course the barrow itself is very much older. Scattered in the various chambers were about 20 burials ranging from a 12 month old baby to adults of 50-60 years of age. Some of the skulls were used by Doctor A J E Cave to carry out a study on many of the individuals and concluded they were most probably related through descent. As I have said, this a great little barrow and is worth stopping by to see, either as part a walk along the public footpaths of the great Wiltshire country side or while passing through the area along the busy main road. This is a great place to visit, it’s difficult to park your car but the efforrt is worthwhile. There were horses in the fields when I visited and they were inquisitive. Although a busy main road is so close there is a peaceful atmosphere and you get that timeless feeling you so often find at Megalithic sites. Visit here if you can, it’s worth your time. What a stunning longbarrow. Must add that to my list of places to visits. Thanks for the heads up. 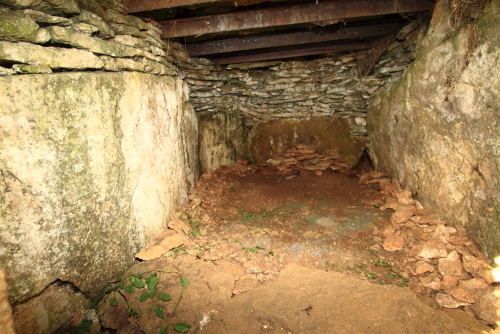 I visit Lanhill long barrow several times a year usually on pagan festive celebration times with my collie dog bilbo,i find it a special place as i love visiting the mystical ancient sites.I have filmed & photographed lanhill long barrow and enjoy the footage on you tube with a soundtrack from’ the wicker man ‘film,great stuff. One of the skulls removed is on display in Devises museum.. I think one of the first facial reconstruction methods was employed on it..
sorts of “new age” types would be camping out there. Visiting lanhill longbarrow yesterday i noticed the undergrowth had been cleared at the entrance to chamber making it more impressive. There is electric fencing around barrow due to sheep being in field.Best way of getting to longbarrow is to walk around the outer edge of electric fencing next to hedge. I went to lanhill longbarrow last sunday 22nd march and found the sheep and thankfully electric fencing had been removed. I appeared on channel 5 at lanhill longbarrow with my dog, sam, doing an interview with my music in backround in the ‘oaps behaving badly’ (on the pull) programme shown on june 30th 2015, and repeated a few times since,. Looks amazing, I thought I knew the megaliths round here pretty well, can’t believe Iv never even heard of it before! Looking forward to a visit, thanks for a great tip.. The Goblin. There was a goblin who lived in a barrow, who came out of a small hole at night the colour of a marrow, looking for food & visited the local farmer to play tricks just for kicks, he laughed & danced but up at the sky he glanced, near sunrise time to go back home before he’s caught & dies. written by Andrew Williams on the 27/12/17/.